Edit: Did some cleaning up, make the previews smaller, and clickable! [img] URL here [/img] code. I tried a few permissions tweaks. Can you see em now? anyone? yah those are the rules, it's important that the group watches for the calls though, so many golfers foot fault off their marker without noticing, and if only one player calls it - it is no foul - you've gotta have a "second" it's common knowledge i call foot faults - on jump putts especially when the "launching" foot touches the mini. just because i hate watching jump putts doesn't mean i hate you - it means i hate foot faults. Indeed. I've learned especially in my fairway drives to step way behind the marker. Its always helpful to remember the 30cm rule, and the 5m on non-penalty relief. certainly comes in handy if you're buried in the woods, or even sitting in front of an evil tree in the fairway. If there's one of these handy guides for falling putts...please post it. drink less before the round so you don't fall. Handy Guide rule #1. Out-of-bounds relief became an issue with my card Sunday morning at Frostbreaker. Bumping thread to bring a visual aid to the discussion we had. This is meant to be a friendly reminder as to two out-of-bounds rules. Not busting nuts, just improving knowledge for all. Within the designated drop zone, if provided. The lie can only go towards the basket if it is perpendicular to the out-of-bounds line, the line itself being out-of-bounds. The conversation ensued as to what 'perpendicular' meant. 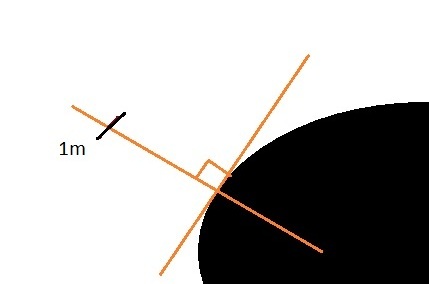 Perpendicular is determinable both on a straight line and a curved line. Again, not busting balls, but increasing our understanding of the game's rules. Can you explain this a little further Rob? A line can not be perpendicular to an arc. 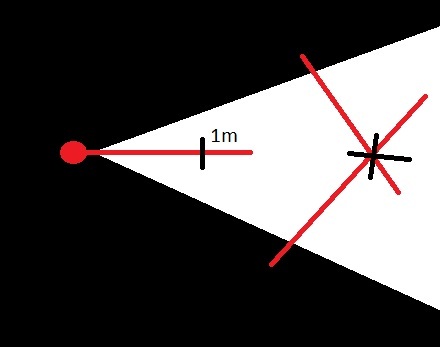 In the illustration you provided the red arc and the green arcs are just construction lines to establish a 90 degree angle between the blue line and the black line through point P. Actually the illustration is wrong if the blue line and the black line are perpendicular there should be a square at point O to designate the 90 degree angle. I believe this may have been referring to me. If so... no offence taken and thanks for following up on this! I think the perpendicular illustration was to try to clarify a question raised on irregular OB. Example would be the OB is a right angle and the disc lands off center on the corner in bounds. The thrower cannot be touching (or have a supporting point in contact with) OB when releasing his/her disc...thus up to 1m of relief. Wasn't calling anyone out, just providing instruction for all. When I took the Official's Exam, I got some wrong too. It's not perpendicular from that line as a whole, but perpendicular from any one point on that line. I believe that this was the case on Hole #17 at Swope Gold at this years KCWO. Where in that corner, taking 1 meter of relief would bring a player closer to the other part of OB. So instead of taking 1 meter from where the disc went out (deep in the corner), a player would take 1 meter of relief from any OB, which would ultimately bring that player more like 2-3 meters from where they initially went OB.